Modern women are strong, self-reliant and multitaskers. They can be thought of as the reincarnation of Goddess Durga in modern avatar carrying on with the daily life chores without ever thinking about their own self. From office to home to kids to grocery to many things more, women deserve respect and admiration for how they handle everything with ease and grace. However, the point of concern is that being human beings, we all are prone to tiredness, soreness of muscles, lack of motivation, stress, depression, etc. i.e. a myriad of physical and mental issues. With so much to do and with so little time in hand, women require something extra that can aid them in their journey of life. Something that can make them refreshed and rejuvenated both from the inside and the outside. And that comes in the form of yoga – the blissful science of life that guarantees a healthy body, a peaceful mind and a calm soul even in the chaos of today’s life. So, here’s a look at some of the yoga poses that women of today’s times can give a try to bring back the zeal in life and feel rejuvenated once more. Stand straight in the mat. Now stretch your feet so that they are at least four feet apart. The right foot should face the front of the mat and the left should be turned to an angle of thirty degrees. Raise the arms parallel to the floor. Bend the right knee so that thighs with the shin form a 90-degree angle to the floor. Hold this position for at least 5 deep breaths. Repeat the pose with the other leg. Apart from benefitting you with a firm core, the legs and arms will also get toned with the daily practice of this pose. This asana also acts as an energy booster. Kneel down on the mat and sit on your heels. With the torso between the thighs, bring the forehead down on the mat. Extend the arms in front. Close your eyes and breathe deeply. Maintain the pose for at least a minute. Apart from relieving the stress that accumulates in the lower back, this pose stretches your hips, ankles and thighs. Fatigue and stress are also reduced considerably with regular practice of this pose. Kneel on the mat with a straight spine. Bend down to place your hands on the mat such that the arms should be shoulder width apart. Press the mat firmly with your palms and lift your knees from the mat such that the knees and ankles are hip-width apart. Lengthen the pose by taking your feet a few inches back. Squeeze the thighs and keep the heels firmly planted on the mat. Relax the head and shoulders. Take deep breaths and be in this position for a minute at least. 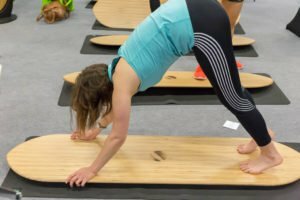 The downward dog pose is a great energy booster. This asana also stretches various parts of the body like hands, calves, hamstrings and shoulders. This is also a recommended pose to prevent the onset of osteoporosis. Hands should be placed on the hips. Now gradually transfer your body weight on the left foot, bend the right knee and place the sole inside the left leg thigh (beginners can place in on the ankle). Maintain the balance and slowly raise your arms above your head with the inside of the palms facing each other (beginners can keep the hand in prayer pose in front of the chest). Take deep breaths and maintain the posture for one minute. This is one of the best yoga asanas to stretch the shoulders, torso, groin and the thighs. Also, with the daily practice of this asana, your calves and ankles will get stronger. This pose is also a natural remedy for those suffering from sciatica and flat feet. Step on the mat and keep the feet hip-width apart. Lift your arms up such the palms face each other. Now bend the knees and gently lower your hips as though you are about to sit on a chair. Tuck in the abdomen so that there is no curving in the lower back. Ensure that the knees do not extend past your toes and put the weight on your heels. Maintain this position for one minute and release. It is evident from the pose that it puts a lot of pressure on the leg muscles and tones them to a great extent. The chair pose is also useful for strengthening the back, calves, ankles and flexors. The abdominal organs, diaphragm and the heart are also stimulated with this asana. No matter what job you or how busy you are in your life, these yoga poses will keep you fit, healthy and strong to overcome the obstacles of a bust life. So, what are you waiting for? Jump on your mat and reinvigorate yourself with these amazing yoga poses. Bipin Baloni is a passionate Yogi, Yoga Teacher and a Traveller in India. 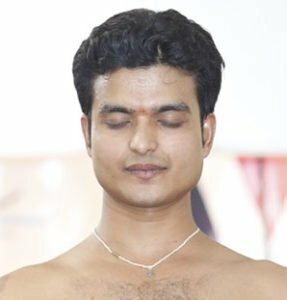 He provides 200 hour yoga teacher training in Rishikesh. He loves writing and reading books related to yoga, health, nature and the Himalayas.